These are the same dyes that Nikolas uses to produce our toner coatings. 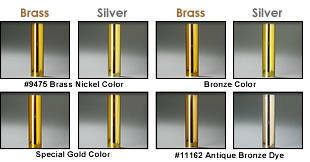 These products are used to simulate antique metal oxide finishes; color brass substrates to any shade of gold or bronze; or to change white metals like aluminum or pewter to brass, bronze or any darker colored metal. 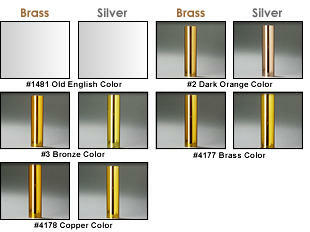 Our dyes may also be used to tint glass and plastics to a variety of colors. 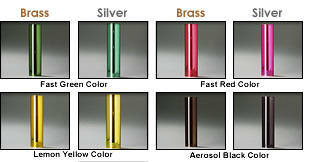 The colors demonstrated here are shown on two different metal substrates, brass or silver so you can see how the base metal affects the final color. 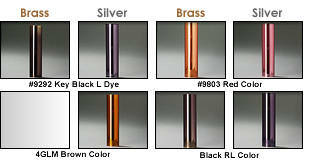 These samples were produced by adding four liquid ounces of dye into 1 gal of lacquer then thinned 50/50 to apply the tube. Virtually any color can be produced. See our toner color section for more examples.